WoPC Home > Argentina > Della Penna > C. Della Penna S.A.
Having commenced sometime in the 1930s as C. Della Penna & Cia, at some stage the company became C. Della Penna S.A.C. e I. 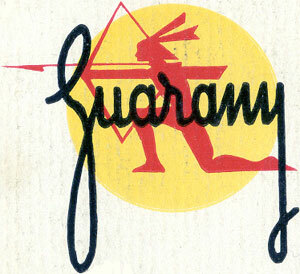 Playing card brand names included "Inca" (Anglo-American and Spanish versions), "Porteño", "Guarany", "Ombú" and "Congreso". In 1978 the firm was taken over by Massuh S.A., a leading paper-maker, and it still exists today as C. Della Penna San Luis S.A. Under new management, and in response to economic conditions prevailing at that time, playing card production was discontinued. None of the original employees remain with the company, so further information is not currently available. Above: five cards from an early "Naipes Inca" pack, 40 cards, manufactured by C. Della Penna & Cia in c.1935-40. The ace of coins is of Cádiz style, but the courts are Catalan style. Later examples of Naipes Inca (c.1950) have the same ace of coins and simplified court designs as the example shown below. Above: five cards from a "Naipes Porteño" pack, 40 cards, manufactured by C. Della Penna S.A.C. e I. in c.1950-55. The catalan style designs have been simplified. Above: back designs from "Naipes Congreso" (1966) and "Naipes Inca" with advertising for Laprida products (c.1970). Special Joker and back design from Naipes Inca advertising pack for Hoechst pharmaceutical products, c.1973. Above: 10 pesos tax band which was affixed outside a box of "Naipes Congreso", c.1966. Thanks to M. Cecilia Lizano for historical information.